Recently we started to survey RV shoppers 48 hours after they submit a lead through RVT.com … And, I have to tell you, it’s been an eye-opening experience! It reveals a lot about the general state of Lead Management in the RV sector. For some, who are NOT effectively “in touch” with their leads, their lack of follow up can prove costly. But, for many dealers, who value and care for their potential customers, they will meet with a fantastic and ripe opportunity to dramatically grow sales. The comments we are receiving from consumers are both gut-wrenching and yet amazingly helpful at the same time. 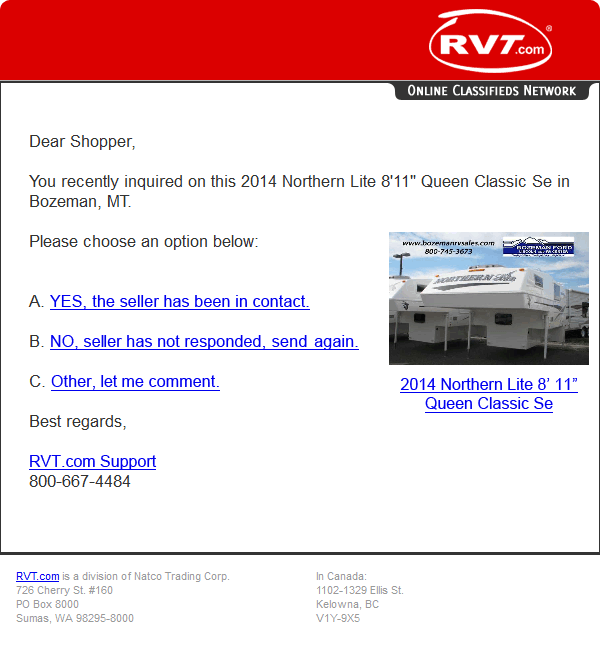 RV shoppers in this Internet age, demand service. Quickly. Many have the money and are ready to buy. They are willing to inquire on a unit, based on info found on your ads but often still have questions – see how to create more informative ads here and also here. If you don’t give them what they’re looking for, they’re only one click away from someone who will. WARNING! DO NOT Try This At a Successful RV Dealership! Here’s a lead who is far enough down the sales funnel that they are actually sending in a credit app and – unfortunately – they didn’t get any kind of response! Photographs help you sell RVs. Use 30. No exceptions. It gives people a better all around feel for the unit. (Also, use video.) The data are clear. More photos (and video) mean you will have more leads to – ahem – follow up which means you’ll move more inventory. Seriously?! My case in point. Hurry up and get on those leads! One of the “lost sale” units above retails for $36,700. Thousands of dollars. Gone. For a simple lack of effective lead follow up. THIS is the kind of feedback we LOVE to see. The respondent is thrilled with the service, the professionalism and the work their sales person is doing on their behalf. They are likely to refer many customers due to their positive experience. If You Want to Make More Sales, Follow Up Your Leads. Pay attention to what they’re asking for and SEND THEM WHAT THEY WANT. It’s one more way you’ll enjoy an increase in your online advertising ROI. This is great I hope many sales people and dealership owners read this, it is so spot on. Great information and you are 100% correct, we find the same thing world wide and as a consultant I always ask the dealer why would you not treat your online customer like you would has if they were standing in your showroom. Once a dealership takes this approach it turns quickly into success. Wanted to print this to share it with our sales manager but your website doesn’t seem to be “print-friendly.” It wants to print out on 8 pages, with display ads and such interspersed in the text. From my Experience in Both Retail as well as Wholesale, The Dealer Principals, Do not have knowledge about the lack of Follow-up in regard to these Advertisements, It is a Shame, Most Customers if they do not receive a Response within 24 hrs, purchase elsewhere or move on to another dealership .. in this new fast paced world of “E” Commerce Speed , and accessibility is Key …. So, you’re thinking DP’s just don’t know there is a lack of follow up. Interesting … Probably a real good thing then that we just implemented a cool new report dealers can access when they login to their RVT accounts. This report tabulates all the surveys we send out to dealer leads and shows the DP (or SM or Internet Sales person) how many of their leads got followed up in more – or less than – 48 hrs. Helpful for them to see, keep tabs on, for sure. And yes, I totally agree that people move on (and buy elsewhere) quickly if they get no response or if dealers do not answer questions that buyers are asking – quickly. I cringe when I see emails from buyers saying they didn’t hear anything from the dealer, so they bought elsewhere. Yikes, that hurts! And sadly, it happens far too often. Thanks for your perspectives Dan.